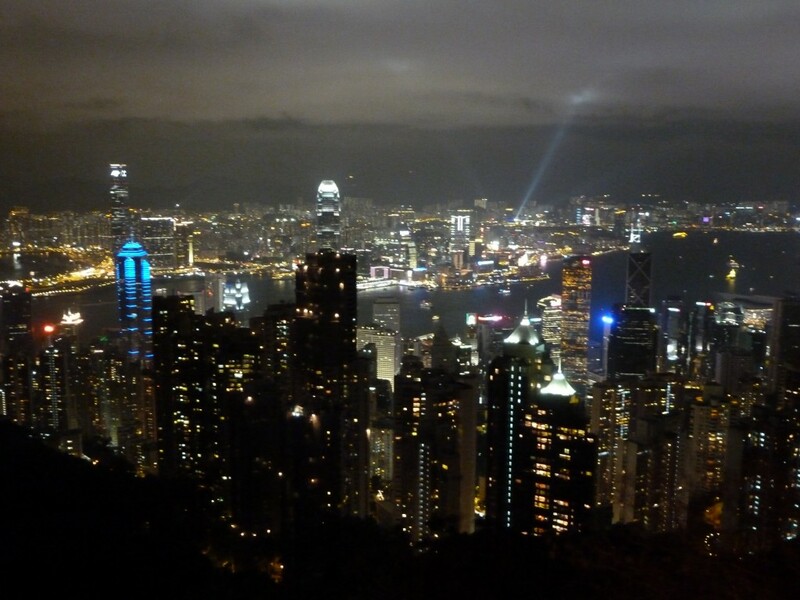 A few weeks ago, I spent two and a half weeks in Hong Kong, preparing for, and then participating in, OpenStack Summit. Our demo involved a single controller node, and a single leaf node. The idea was to model a much larger deployment, where you’d have a central controller and then one leaf node per rack. The leaf node takes commands from the controller, and handles provisioning the machines in its rack. That makes keeping racks on isolated L2 domains easy, but also helps ensure things would scale. In our setup, with just one leaf node and one controller, the leaf node was not necessary. 10-15 minutes to provisioning eight machines seems pretty fast overall, but there’s still plenty of room to make this much faster. A surprising amount of the time was spent just waiting for machines to POST. (Stuff like getting the boot order right is also important in keeping this under control.) One problem I found is that the image deploy process from the leaf node seems to happen serially, rather than doing all of the machines in parallel. We were more or less bottlenecked on the network speed, so parallelizing that wouldn’t have necessarily led to a massive improvement, but it’s something that should be fixed. There were something like 3,500 people in attendance. I knew OpenStack was a substantial project, but seeing the crowd—and knowing that many of them travelled literally thousands of miles to be there—really drove home just how enormous the community is, and how quickly it is growing. And there was certainly no lack of enthusiasm. I spent most of the Summit at the booth instead of in conferences. (We’ll have to work on this next time!) Most of the sessions were recorded, and can be watched here, though. Even not attending the sessions, it was a great opportunity to meet many of the people that I’ve only worked with online thus far. Fellow Red Hatter Steve Gordon captured a lot more of the Summit here. 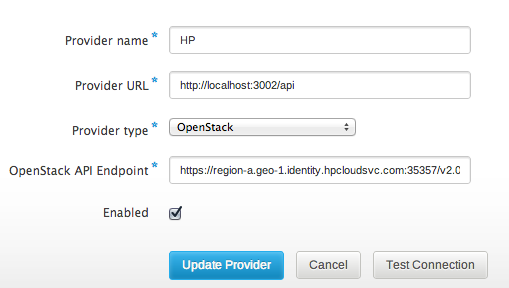 I’m happy to report that the latest code we’ve added, which adds OpenStack support to Aeolus and will ship with our next release, is working successfully with HP Cloud, expanding our repertoire of public clouds. 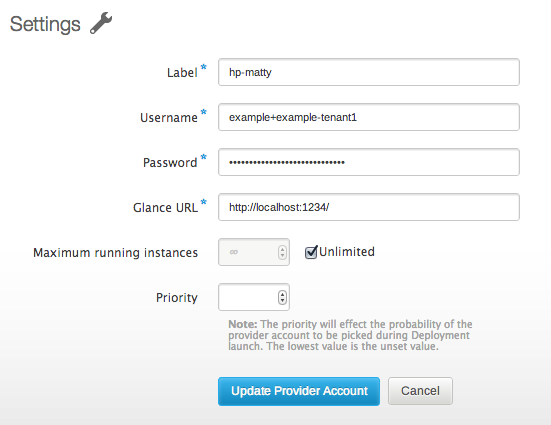 But enough about what doesn’t work — HP’s cloud service does work! Getting it set up took a little figuring out, though, so I wanted to share some details. This much is straightforward. Adding a Provider Account is a little more of an adventure. 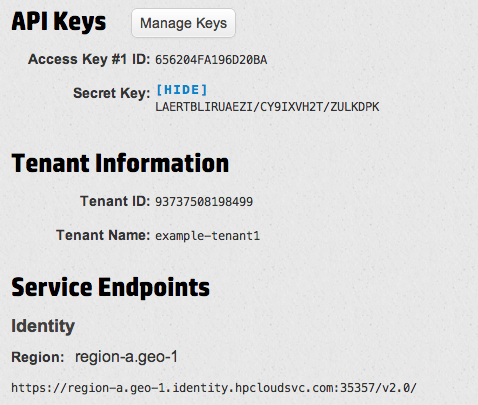 Despite what their documentation may say, the only way I’ve been able to authenticate through Deltacloud has been with my username and the tenant name shown — not the API keys, and not the Tenant ID. In the example above, my Tenant Name is “example-tenant1”, with a username of “example”. So in Conductor, I’d want to enter “example+example-tenant1”, since we need to join username and tenant name that way. Password is what you use to log into the account. Here you’ll notice that I cheat — Glance URL is currently a required field in Conductor. 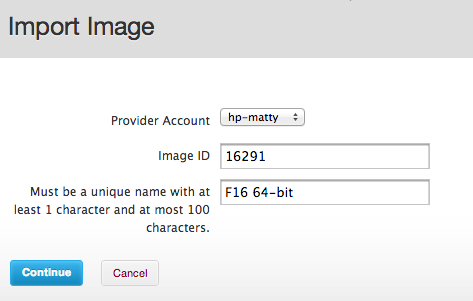 As best as I can tell, HP Cloud does not currently expose Glance to users, so there is not actually a valid Glance URL available. I’ve opened an issue to fix this in Conductor, but for right this second I just used localhost:1234 which passes validation. As this may imply, we don’t presently support building images for HP Cloud, either, though there’s work being done to allow snapshot-style builds (in which a minimal OS is booted on the cloud, customized in place, and then snapshotted). What does work today are image imports, though. With an image imported, the launch process is just like with other providers, and you’ll be able to download a generated keypair and ssh in. Of course, the job isn’t finished. The ability to build and push images is important for our cross-cloud workflow, and it’s something that’s in progress. And the Glance URL process is quite broken. But, despite these headaches, it works — I’ve got an instance running there launched through Conductor. In not-very-scientific (nor real-world) tests, hdparm -t showed 310.29 MB/sec throughput (932MB in 3.00 seconds). Various speed tests give scattered results, from 2-6 MB/sec. (16-48 Mbps), though it’s entirely possible that the bottleneck was the remote server. I must say, though, that yum is faster than I have ever seen it before. They do seem to block outbound ICMP, probably due to abuse problems. They also appear to block NTP, which is odd and makes me wonder what else is blocked. I don’t plan on switching over any time soon, but at the same time, it’s tempting to think of $10/month as a reasonable expenditure if I find myself needing something to host the occasional app or whatnot.